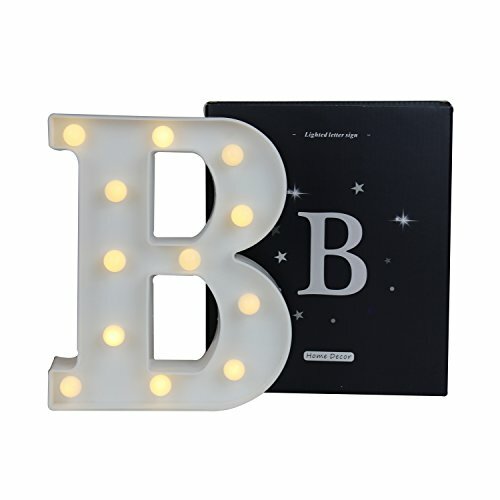 Spell out any name or phrase with these fabulous light up alphabet letters! When switched on the LED lights give a bright eye catching warm white glow and adds a fabulous ambiance to any room. The beauty of these is that there are no cables and each takes 2 x AA batteries (not included) and lasts long lifespan to the LED lights. They hang or stand and it's easy to get to the switch to turn off and prolong battery life when not needed. Suitable for home, birthday party, outdoor, bars, cafes decorated. Depth: Approx. 4.5 cm /1.77"
Marquee letter alphabets, Light up your favorite words for special occasion, event, or home decorating. ABCDEFGHIJKLMNOPQRSTUVWXYZ & 27 alphabetic character LED lights, such as for arbitrary combination into I LOVE U, HOME, MARRY ME, U&M, etc. Made of Plastic, Requires 2 AA batteries, not included, can be hung (has keyhole slot in back for easy hanging) on walls, mantels or placed on top of a reception table during your event or celebration. Our illuminated marquee lights are highly versatile and portable as they measure just 8.66 inches tall, 1.77 inches thick, can be hung on walls and will take 2x AA batteries so they are not too oversized and will not need to be plugged into an electrical outlet. View More In Decorative Accessories. If you have any questions about this product by DELICORE, contact us by completing and submitting the form below. If you are looking for a specif part number, please include it with your message. Casa Bellante - Bamboo Serving Bowl, Food-Safe Finish, Medium. Plum. 8 x 4in.